We are thankful for our volunteers. With their assistance we can realize successful events and ensure our participants a good support. 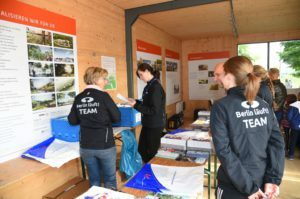 Whether on the course, at the refreshment points or at the race document collection – every helping hand contributes to the success of our events. 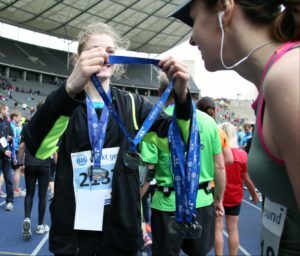 Apply now for volunteering for Berlin läuft! and become a part of our events. Due to working close with the team you will have the opportunity to see behind the curtain of an event organisation and you will be in charge of responsible tasks. Our courses pass through the streets of Berlin. Thus, roadclosures and alternative routing are essential that the participants can complete their run without hindrance. At crossraods volunteers support the police. You take care that pedestrians, bicyclists and car driver will not interfere with the competition. In confusing situations you guide the participants the right direction. Additionally you give event information to the public. There are several refreshment points along the course and behind the finish line. Snacks and drinks are placed for the participants to replenish. You and your team take care that there is sufficient and fresh supply available for everybody. One or two days before the event participants are asked to pick up their race documents at a central place in Berlin. 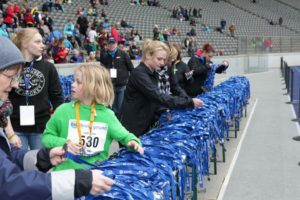 You will organize all the information including the BIB numbers in bags and hand them out to the participants. Moreover, you update the runners with the latest information. On the event day participants can store their clothing bags in our tents. Before the race starts they hand in their clothes and you organise them decently in our storage, after the race you take care that everyone gets back the right clothing bag. Finishing the race participants are exhausted but happy about their achievement at the same time. You are waiting just behind the line to acknowledge their performence and hand over the finisher medals. Additionally, supporting our team with the preparations of the medal ceremony is part of your volunteering. Here you can register as a volunteer. After the registration you will receive a confirmation via e-mail with your selected account name. Use this name and your chosen password to log into your volunteer profile on our volunteer database. Here you can sign up to volunteer. If any problems or questions regarding registration process occur, check the FAQs below. Maybe you can find the right answer here. Otherwise feel free to send us an e-mail to volunteers@berlin-laeuft.de. How can I apply for volunteering at an Berlin läuft! event? If you are interested in volunteering for Berlin läuft! please register in our database. After that you can log into your profile and apply for the events you would like to support. When do I get all information regarding my volunteer job? At the end of our application period we do the shiftplanning. Latest one week before the event we will send out all necessary information regarding your job. If there are more applicants than needed and thus we can not consider your application, we will inform you as well. What are the benefits of volunteering for Berlin läuft!? Every volunteer gets an apparel item (shirt or jacket) as well as an expense allowance. At the end of the year we will hand out a certificate to every volunteer. Am I insured during my volunteer job? As long as you are working on Berlin läuft! behalf you are insured in case of accidents. The way from and back home is included. What happens to my data given at the registration? Following our data protection regulations your personal data are used for the volunteer administration and shiftplanning. The whole Berlin läuft! staff as well as the volunteer teamleader have access to your data as well as our service contractors in scope of their activities. Your data will not be passed on to other third parties without your agreement. I forgot my login data, what should I do? If you forgot your password, you could request a new one using the password function. In case you have lost your login data (password and user name) just send us an e-mail to volunteers@berlin-laeuft.de. How can I cancel my application for an event? Until the application deadline you have the opportunity to cancel online if you are not available anymore. After this date please send an e-mail to volunteers@berlin-laeuft.de as we have already started to allocate the shifts. If you have already received the information regarding your volunteer job, please contact your volunteer teamleader directly in order to cancel your duty. How can I cancel my registration as a Berlin läuft! volunteer? 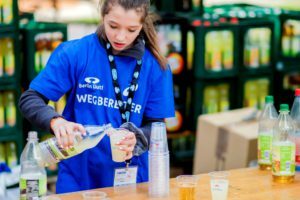 If you are not interested in volunteering at Berlin läuft! events anymore just send us an e-mail to volunteers@berlin-laeuft.de and we will delete your data.